Adam Herold Legacy Foundation Apparel Available! Inaugural hockey and leadership development camps a success! Just months after the Humboldt Broncos’ tragic bus crash, the 2018-19 hockey season began. Ceremonies were held in conjunction with many of these games to remember both Adam and the rest of those involved in the April 6th accident. On September 12th, immediately following the Humboldt Broncos’ home opener, 29 banners were unveiled to commemorate the 16 lives lost, as well as the 13 players who were injured. 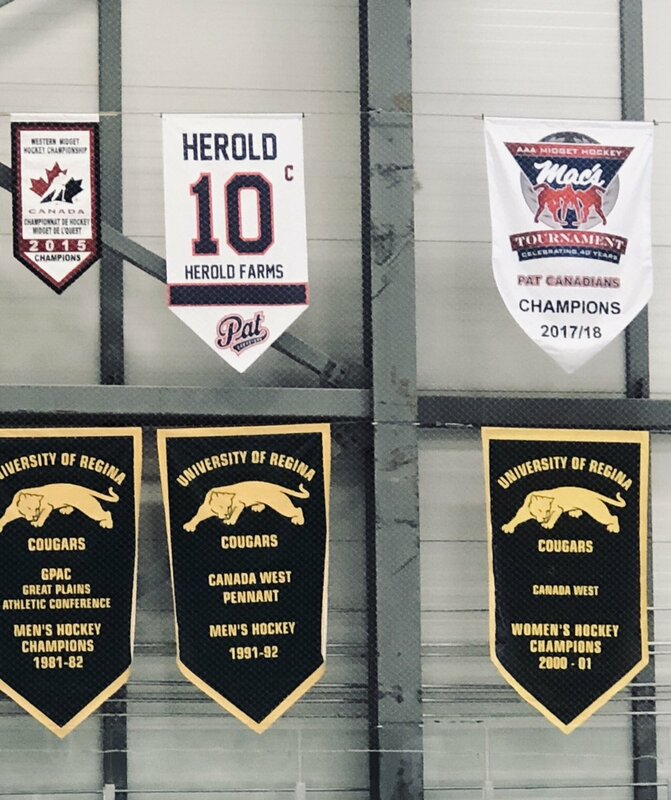 Also unveiled that evening was a banner that read: “We Play for Them.” The Canadian Junior Hockey League, in conjunction with the Saskatchewan Junior Hockey League and the other nine Jr. A leagues that comprise the CJHL, announced that the banners will hang in each of the CJHL’s 133 member clubs for the 2018-19 season, as a tribute to the Humboldt Broncos. On September 21st, the Prince Albert Raiders honoured Adam at a pregame ceremony before their season home opener. 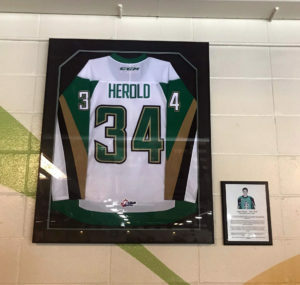 A plaque and framed jersey now hangs between Sections 3 and 4, in honour of the #34 jersey Adam wore with the Prince Albert Raiders. The Regina Pat Canadians home opener took place October 13th. A pregame ceremony paid tribute to Adam and his two seasons with the team and his #10 jersey was retired. 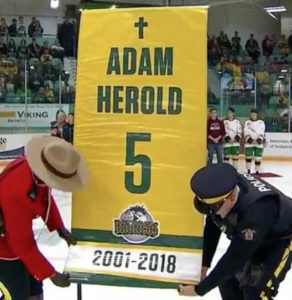 The Adam Herold Memorial Award was also announced as part of the ceremony. The annual award will be presented to the Saskatchewan Midget AAA Hockey League’s Top Defensive Defenseman who exemplifies superior leadership both on the ice and in the dressing room. 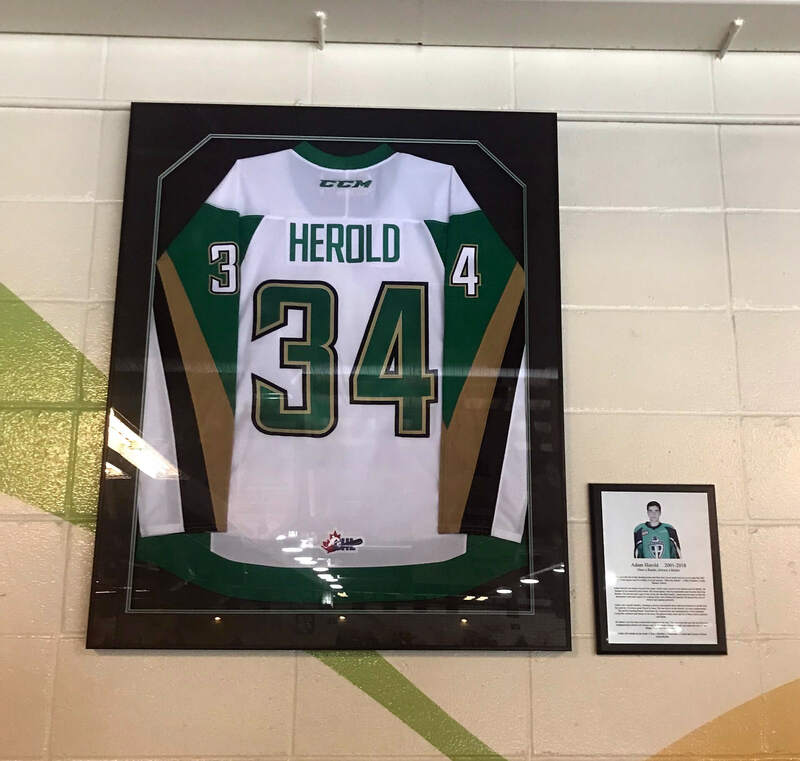 The Prince Albert Raiders honoured Adam with a plaque that now hangs in the Art Hauser Centre, along with Adam’s PA jersey. Here is what is inscribed on the plaque. “You have the kid in the dressing room and they don’t even really have to try to make the kids around them respect and love them, it is just natural. That was Adam!” – Mike Dumelie, Coach, Mentor, Friend. Adam Herold was mature beyond his years, which was a credit to his parents and his family. He learned to be respectful and honest. He loved openly with his teammates and became their big brother. He was not just a guy in the room; he was their family. Adam took the time to earn his teammates’ trust and respect by making every one of them feel special. He played the role of mentor and captain perfectly. Adam was a model student, wanting to always accomplish more and push himself to be the best he could be. He was a great friend to many. He was active in the church. An avid outdoorsman. The perfect hunting buddy. Passionate for conservation and sustainability of the wetlands. He loved the outdoors and being on the farm. He played many roles, and all of them with maturity and focus. At Adam’s core he was a warm and compassionate soul. You can learn the rest, but an authentic, compassionate person will always end up as a leader because people can sense the core of their being. Adam Herold was that guy. Adam will remain in our souls. A son, a brother, a teammate, a friend, and forever a Prince Albert Raider.